You are welcome to browse our collection of Murano Glass Aquariums, handmade with traditional tools and processes. Wonderful colored glass in green, pink, blue and yellow is drowned in the crystal, creating the illusion of an aquarium full of tropical fish, live plants and other marine decorations. These pieces are so lifelike that many have been fooled into thinking they are acrual aquariums created in the incredible shapes on display in our online store. 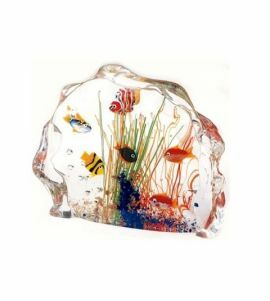 You can choose to decorate your home with an aquatic, marine or topical theme using precious objects like our Murano Glass Aquariums but you can also offer these wonderful pieces as gifts to those you love. These intricate and eye-catching art pieces can also be used to decorate restaurants, coffee houses or boutique clothing stores.